Yesterday, Country Living Magazine reposted my Instagram pic! In their April issue they asked readers to post “how and where” we enjoy Country Living. I shared the above picture of my sketchbook, where I created illustrations from the April issue. Sometime after 2001 – Girl (new mom, me) from the suburbs of NYC falls in love with Country Living Magazine. She finds it creatively inspiring. 2014 – Girl starts mycreativeresolution.com and includes Country Living as one of her inspirations. Girl sees illustrations in Country Living and dreams about one day creating illustrations for the magazine. 2015 – Girl thinks about approaching Country Living with a sampling of “country” illustrations. She works towards this but doesn’t follow through. Girl reads April issue of Country Living and sees the call out to share on Instagram. 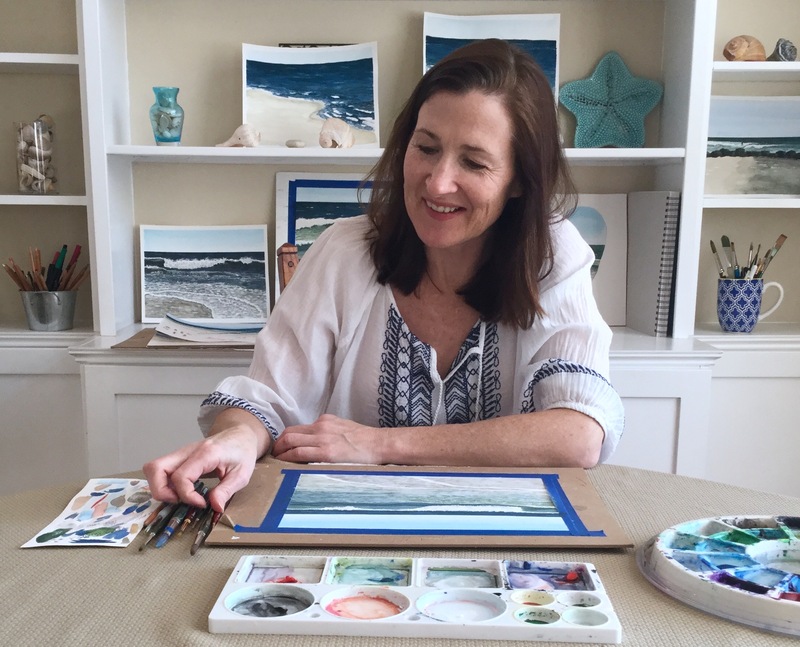 She pulls out her watercolors. 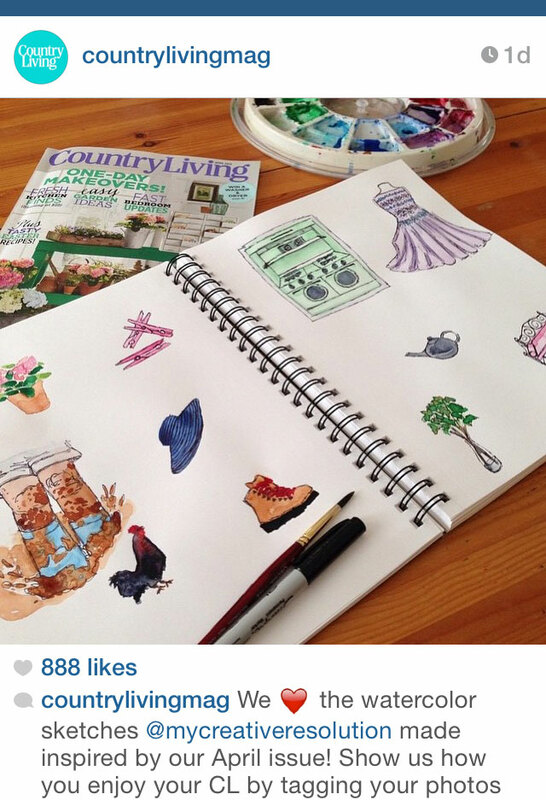 Girl posts picture of sketchbook with #mycountryliving. Country Living “likes” girl’s post. Girl goes crazy with excitement. Shares news with family. Country Living starts following Girl (@mycreativeresolution). Girl gets more excited. Shares news with family. Girl checks Instagram and sees numbers – next to the likes and follows – that don’t make sense. 44 likes? 23 new followers? Instagram must be broken. Girl realizes that Country Living Magazine reposted the sketchbook picture – thereby sending people to Girl’s Instagram. Girl passes out from excitement. Girl recovers and at the end of the day, realizes she has 43 new followers. 888 people liked her picture on Country Living Magazine’s Instagram! 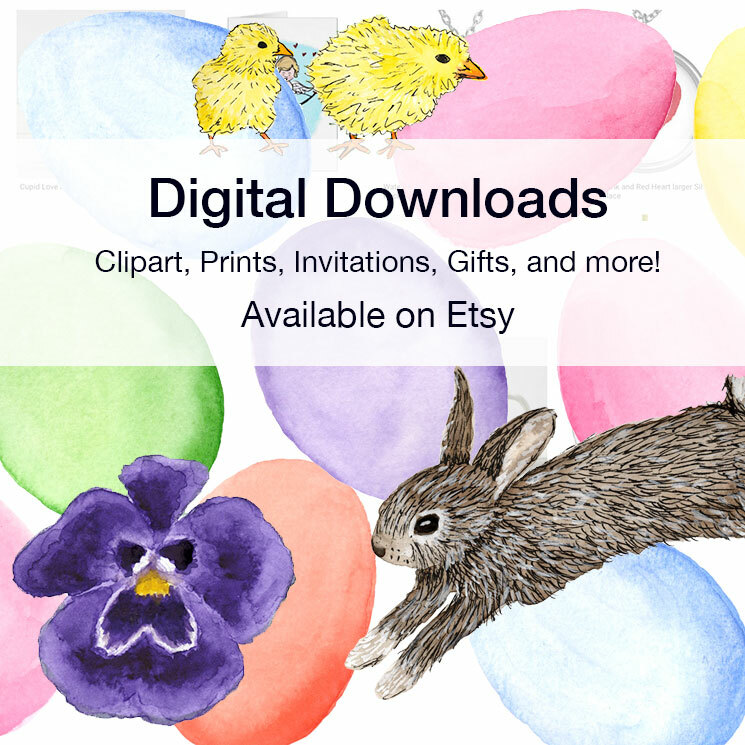 Categories: Inspiration, Watercolor | Tags: Art, Country Living, Country Living Magazine, illustration, ink, painting, watercolor | Permalink. Happy dance, happy dance!!! Yippee!! Yahoo!! So excited for you!! Thank you Margie! It’s almost the season of new beginnings. I’m hoping this is one too. Amazing, Girl! : ) Congratulations. And I love it here – great stuff. I have such a big awesome grin. I love this post, I love the way you wrote it! Congratulations! Here’s to more likes and followers! Haha omg! I can see the grin on your face. Awesome work deserves recognition! What a cool story! Fabulous post, Eileen! Terrific storytelling skills. Love how you build tension. You had us at “Sometime after 2001” and we followed you every step of the way to the end. Heartwarming story. As many a creative person will attest to, we don’t necessarily ply our trade for financial gain, but for a myriad other reasons. Recognition and validation from those we admire is worth more than gold to us. Of course, that’s not to say that we shouldn’t be compensated for our art, but the almighty dollar is not what drives us to create. Congratulations!!! Super excited for you. Congrats! Happy for you. I like your exciting news and the story behind it.